Crochet a Fun Mix and Match Afghan! Want to crochet a fun mix-and-match afghan? Browse through these free crochet patterns for coordinating afghan squares. Pick out the ones you like, and then help yourself to the free crochet patterns and charts. Diagonal Striped Afghan Square Worked in Single Crochet Stitch. Diagonal Stripes Afghan Square -- Photo © Amy Solovay, Licensed to About.com, Inc. This fun checkerboard pattern was the first afghan square in the series. It's crocheted in three different colors of Caron Simply Soft yarn, but feel free to substitute different yarns if you prefer. These crocheted afghan squares feature a mini-checkerboard design. Each square on the checkerboard consists of only three single crochet stitches making this one the smallest checkerboard in the series so far. The squares are crocheted in two colors, and then you add surface crochet details using the third color. The surface crochet helps the checkerboard pattern to pop out from the background. This design is one of the quicker/easier patterns in the series; it was a breeze to whip up four different, but similar, colorways, which you can see in the photo pictured at left. I could envision using this design in so many different ways; it could be the basis for an incredible multicolored afghan if you make it in a variety of different colorways; or you could combine it with more of the patterns in this series, which would also give you many interesting possibilities. This square features a diamond motif with outlines worked in surface crochet. A simple evergreen tree is the focal point of this crocheted afghan square with cross-stitched background and surface crochet accents. Framed Checkerboard Afghan Square. Framed Checkerboard Afghan Square -- Photo © Amy Solovay, Licensed to About.com, Inc. The focal point of this afghan square is a small checkerboard design which is nested inside an outer solid-colored frame. Made with love: The focal point of this afghan square is a heart design. See more free heart patterns for crocheting a variety of different projects. This square is similar to the heart square pictured above, except that the focal point of this afghan square is a diamond design. Crocheted Afghan Block Featuring Two-Tone Nested Squares. Nested Squares Afghan Block -- Photo © Amy Solovay, Licensed to About.com, Inc. This design is so simple, yet so versatile. You can use it as-is, or it could be a springboard for creating many other different designs. I've been cross-stitching the center panel to create other interesting variations. Nested Squares Crochet Chart. Nested Squares Crochet Chart -- Chart © Amy Solovay, Licensed to About.com, Inc.
Want to create your own cross-stitched designs for the center panel of the nested square block? Just print out the large version of the nested squares chart and draw Xs where you want your stitches to be. Have fun! Changing Colors in Single Crochet Stitch. Changing Colors in Single Crochet Stitch. Photo © Amy Solovay, Licensed to About.com, Inc. If you'd like to crochet any of these afghan squares, you'll need to know the tapestry crochet technique. It's also helpful to know how to change colors in single crochet stitch. It's easy to do once you get the hang of it, but like every crochet technique, it takes a bit of practice. 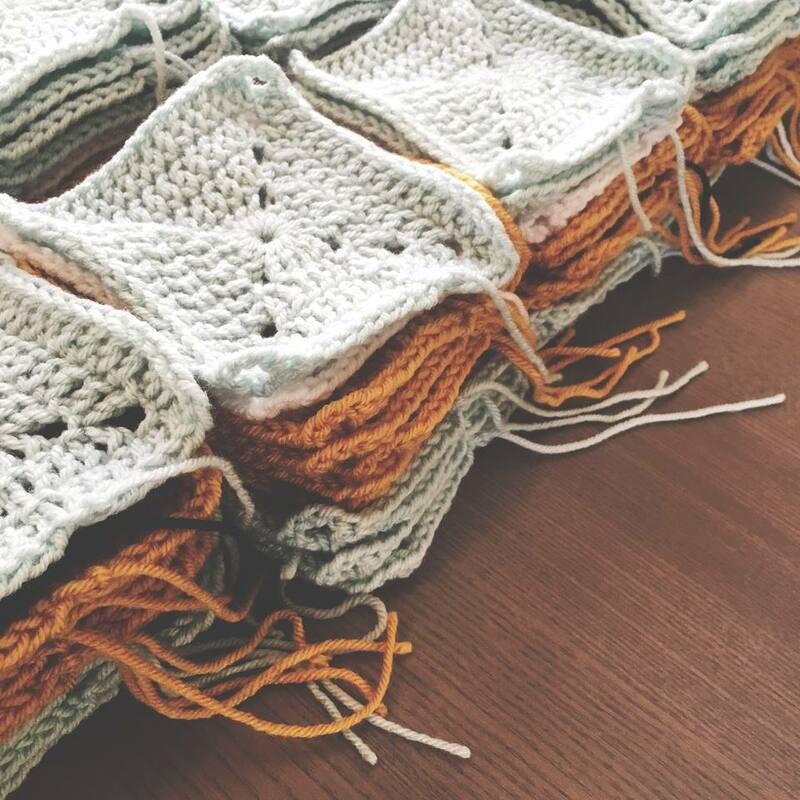 If you're new to crocheting with mid-row color changes, I recommend starting with the nested squares afghan block which is a super-simple design; you won't have to think too hard about it once you get started. The three-color checkerboard pattern is also an easy design, as far as colorwork patterns go. 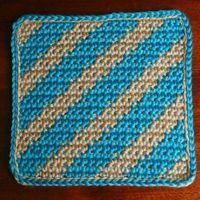 The diagonal stripes afghan square is more challenging to crochet; it's a fun design, but I wouldn't recommend it as a first project.